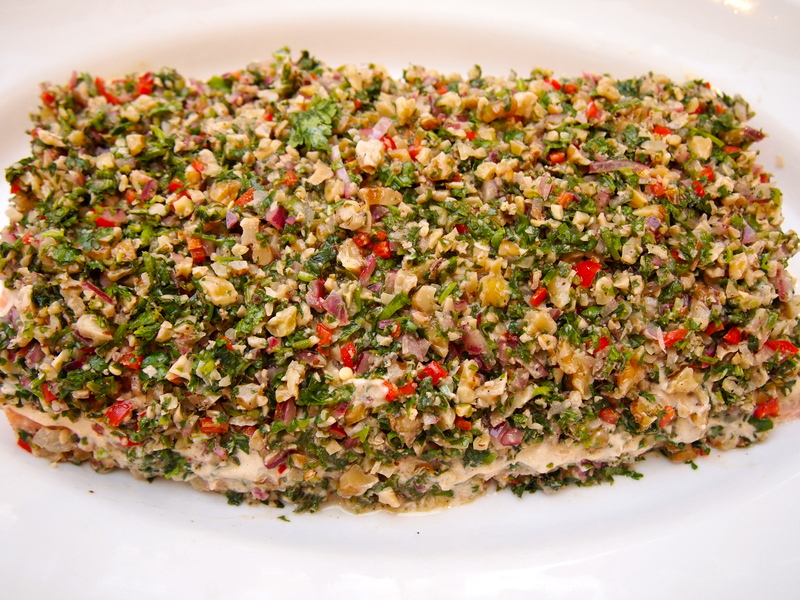 I’ve been wanting to make Greg Malouf’s salmon tarator ever since I first saw him cook it on the television series Food Safari when host Maeve O’Meara proclaimed it the best salmon she’s ever tasted. Now when I hear someone say that, especially Maeve whose had her fair share of incredible meals, I get very excited. And this is definitely a dish to get excited about. It’s such an unusual way of preparing salmon both in the cooking method, ingredients and serving style. It’s actually perfect for a buffet table and this being Easter a perfect dish to serve on Good Friday or Easter Sunday. 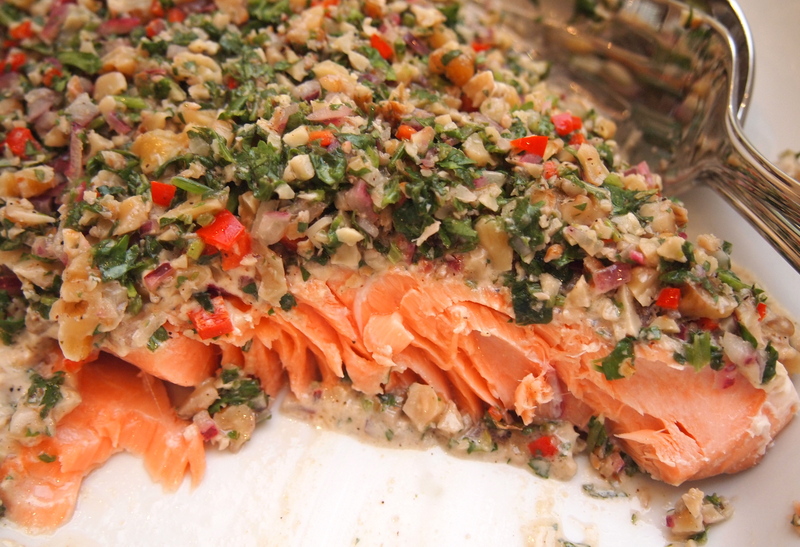 Greg Malouf cooked a whole salmon and if you’re feeding a crowd this would be the way to go. I was making it for just 4 people so I used half of one side of salmon which weighed about 1kg. You could of course use a whole side of salmon that will easily feed 6-8 people and the leftovers are delicious. The salmon is baked in the oven, wrapped in baking paper, and then doused with a tahini spiked yogurt sauce and topped with a thick layer of very finely chopped coriander, red onion, chilli and walnuts – told you it was unusual! 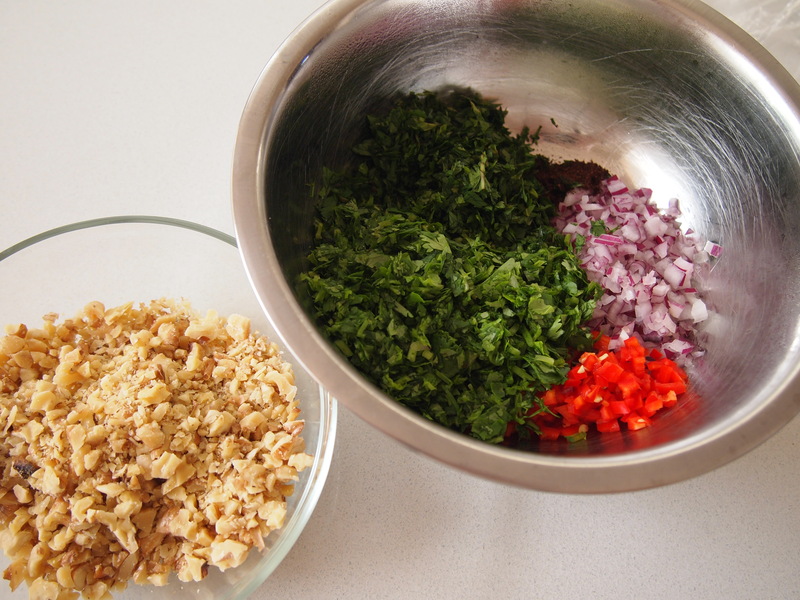 This is an easy dish to prepare but real time needs to be taken in finely chopping all the ingredients – getting lazy with this step will result in a poorer finished product. Don’t be sacred either by the short cooking time at a low temperature; the salmon will come out just on the verge of medium rare with an almost confit like texture that tastes even better than poached salmon. The final dish is served at room temperature so it can be prepared in advance which makes it even more entertainment friendly. 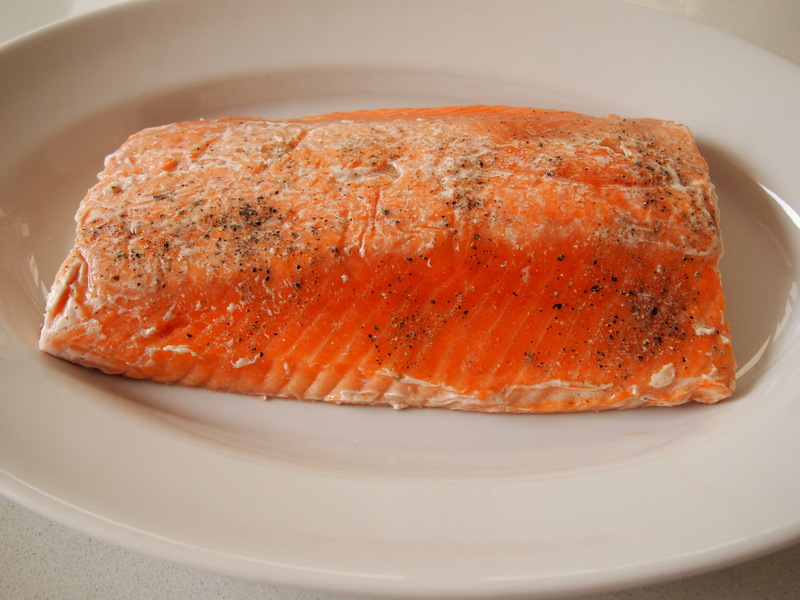 To prepare the salmon, trim about 1.5cm from the belly so you have a neat, even sided rectangle. Remove all pin bones. Brush the salmon with olive oil and season all over with salt and pepper. Cover and refrigerate for 1 hour. Preheat the oven to 100C. 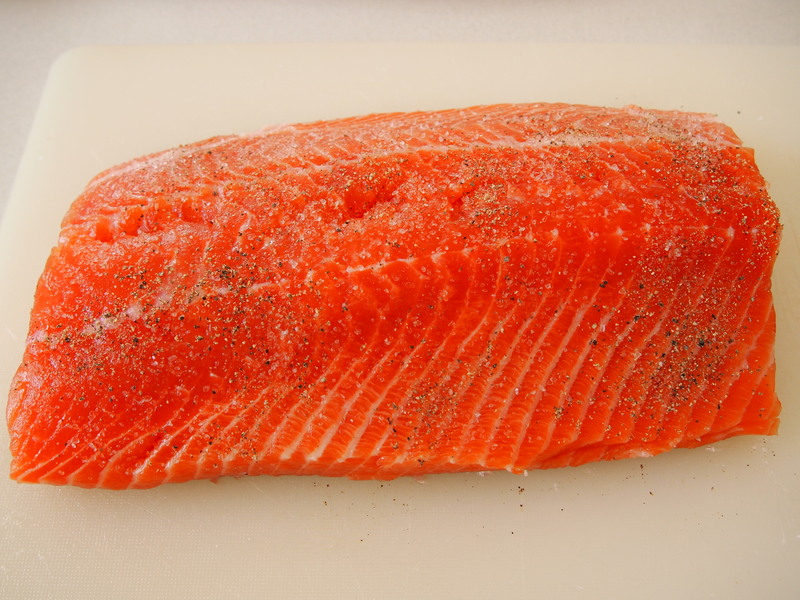 Remove the salmon from the fridge and allow it to come to room temperature. Then wrap in baking paper and place skin side down, in a large baking tray. Bake for 12 minutes. Remove from the oven and carefully turn the salmon skin side up. Return to the oven for a further 12 minutes. Remove from the oven and leave to rest in the tray for 10 minutes. Unwrap and discard the paper. Peel away the skin, then gently scrape away all of the grey blood line from the fish. Set aside. 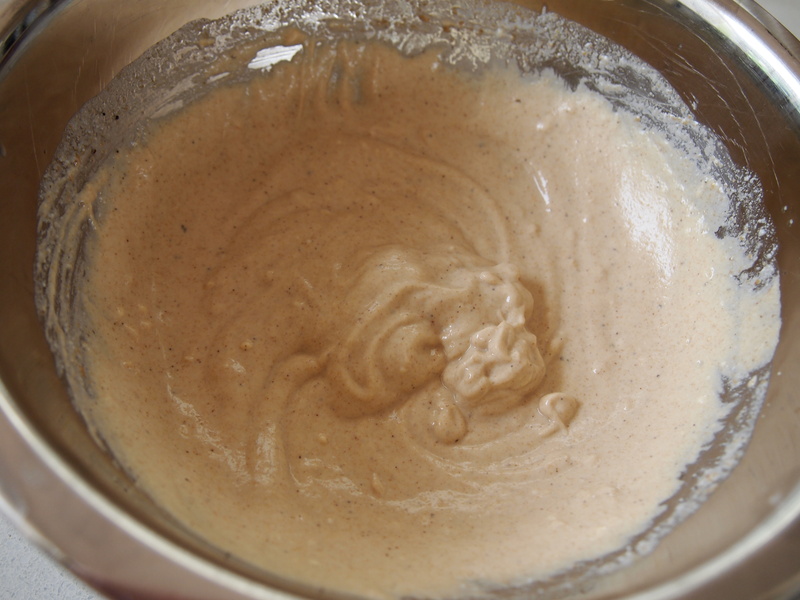 To make the yoghurt whipped with tahini, whisk all of the ingredients together until smooth and creamy. To make the tarator, preheat the oven to 160C. Spread the walnuts out on a baking tray and roast for 8-10 minutes shaking them around from time to time so they colour evenly. Tip the nuts into a tea towel and rub vigorously to remove as much of their papery brown skin as possible. 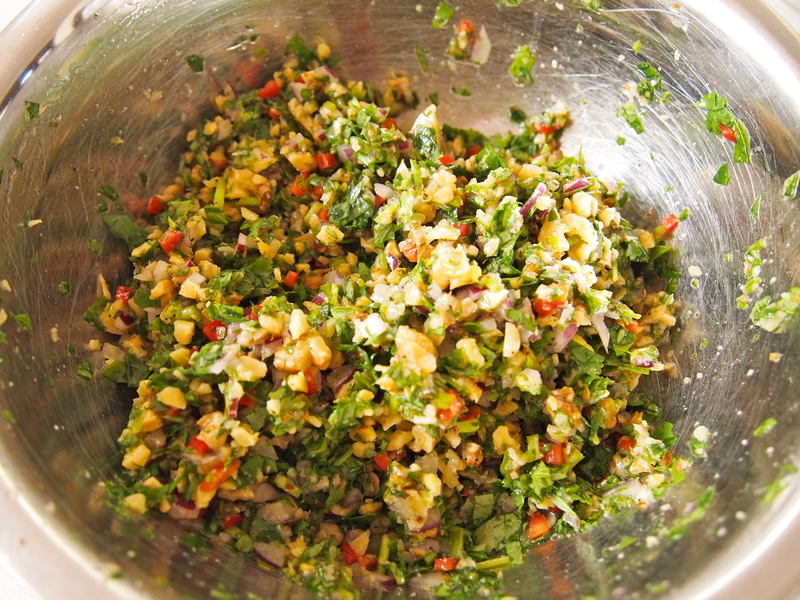 Chop the walnuts very finely and put in a mixing bowl with the coriander, onion, chilli and sumac. Pour on the lemon juice and oil, season with salt and pepper and mix well. To serve the salmon, smear the exposed surface with the yoghurt-tahini sauce, I like to have a generous coating of this; then pack on the tarator topping neatly and evenly so it completely coast the fish. Serve at room temperature with some extra sauce on the side. lovers but this piece of writing is genuinely a good article, keep it up. Thanks so much for your comment – appreciate it! Hi, I made this dish for 30 friends on my 60th birthday last year and it was fantastic – I did 3 whole fish and tripled the ingredients – I’m not much of a cook but this was not difficult with fantastic results – everyone raved about it. I want to make it again for a dinner party and am very happy to find your step by step guidance here. Was also wondering if you can recommend accompaniment for it – which grain do you think would be good with it? Last time I just made lots of different salads as it was a lunch event. Hi Koko, Thanks for your comment and I agree it’s a fantastic dish, especially for entertaining. I served it with a cous cous dish that I saw Yotam Ottolenghi make on a recent cooking show. Basically cous cous that has some lightly caramelised onions, finely chopped parsley and golden sultanas mixed through it. I thought it complimented the salmon perfectly. Thanks I have made this so many times over the last month. I love your clear step by step instructions. I plan to try the sausage rolls next. Hi Sara, so glad you tried this and enjoyed it and the sausage rolls are a winner too! Oh my goodness. I made this tonight for a small dinner party with friends — it was ABSOLUTELY delicious! Thank you for posting the recipe along with your comments and step-by-step instructions. All of that was super helpful (especially reassuring us that 24 mins at 100C was enough!). I have to say, the yoghurt/tahini sauce may have been my favorite part. So good! Thanks again. Thanks CMI for the comment and so glad that you enjoyed the dish and that the instructions were helpful! Looks like delicious !!! Which wine/grape variety/region would you recommend to pair this recipe ? Thank you very much for your answer. Hi Dimitri, I’m no wine expert but I would think a pinot noir would pair well with this or if you prefer white wine a riesling, but not too sweet. Enjoy! I’ve tried to google your cous cous side dish with caramelised onions, finely chopped parsley and golden sultanas but can’t find a recipe. I LOVE this fish.. wondering if you could post the side recipe. For a side for 4. Finely slice 2 large onions and cook in olive oil until lightly golden, you don’t want them to be very dark, just a nice light brown. Best to do this over medium-low heat and should take about 15-20 minutes. Then Bring 2 cups of chicken or vegetable stock to a boil in a medium saucepan. Take off the heat and add 1.5 cups of cous cous, a large pinch of salt and a good knob of butter. give it a good stir then place on a lid and let it sit for about 15 minutes. In the meantime place 1/2 a cup of golden raisins in a bowl and cover with boiling water. Let sit for 5 minutes then drain. When cous cous is ready lightly fluff it all up with a fork, stir through the onions, raisins and a large handful of chopped parsley. Check for salt and add more if needed. So glad you enjoyed the salmon and we also make it frequently for both Christmas and Easter.